Bee relocation is preferred over extermination due to the importance of having bees around. Many species of bees are relatively harmless and provide humankind with valuable pollination services that ensure our continued food supply. That doesn’t mean you want a large bee colony anywhere near your Miami, Florida home putting your family at risk of stings or anxiety. Other species, such as carpenter bees, can quickly cause damage to your home and need to be dealt with appropriately. 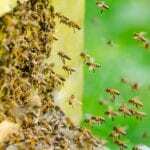 Our proven bee control methods here at Florida Bee Removal utilize advanced industry technology that is always effective yet safe for your family and pets. Our experienced technicians are licensed and insured and will provide you with a written guarantee. They are qualified to locate the bee colony whether it is outdoors or inside your home and resolve the problem in an efficient and safe manner. Bee relocation is preferred over extermination due to the importance of having bees around. While you may not have a vegetable garden that depends on their arduous work, you eat foods that wouldn’t be around if it weren’t for bees. When we relocate bees, they can continue to do their vital work in an area where they are safe and so is your family. Contact us today for an onsite inspection by a bee relocation professional. There is no charge for a bee control assessment done by us. Whether you are having trouble with bees at your home or at a business, count on us for prompt response, including after hours for emergency situations. If you have any questions about our company or services related to stinging insects, don’t hesitate to contact us.